The so-called Clean Air Delivery Rate (CADR) is the international standard for measuring the cleaning efficiency of air cleaners. 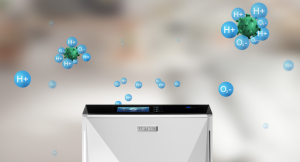 It determines how much cubic meter indoor air can be efficiently filtered in one hour. Our high-performance air purifier D600 has a CADR of more than 500m³/h. Derived from the CADR and the determined room size, it can be specified in how many minutes a complete cleaning cycle of the indoor air can be achieved. All Luftmed air purifiers are able to completely clean your indoor room air in less than 15 minutes under optimal conditions. All Luftmed air purifiers have an effective cleaning efficiency of at least 99% for organic substances, such as bacteria and viruses. The killing of viruses takes place in 1 hour. All Luftmed air purifiers have an effective cleaning efficiency of 99% in 2 hours for hazardous gases (TVOC). 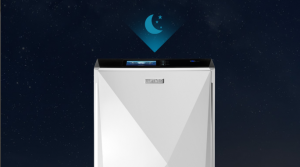 The Sleep Mode integrated into Luftmed air cleaners also allows optimal air purification at night without affecting the sleep. The device detects the ambient light with the aid of intelligent light sensors. 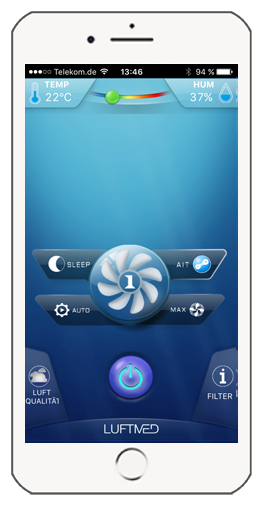 As soon as no light sources are switched on in the room, the air cleaner is automatically initiated into the Sleep Mode. The engine continues to purge at the lowest and quietest level (32 decibels). In order not to produce any disturbing light during sleep, the air cleaner switches off both the display and the LED light indicator. 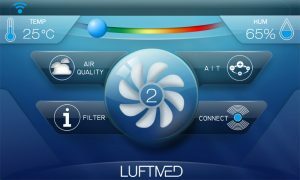 The Auto Mode developed by Luftmed ensures an efficient and intelligent air purification of the interior air. The CPU chip built into the air purifier processes the information transmitted by the sensors to achieve even more effective and intelligent air purification. 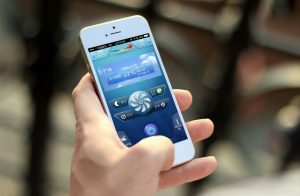 The device automatically switches to the most efficient cleaning stage (Sleep to Max Mode) in Auto Mode, starting from the currently measured air quality in the interior. In Auto Mode, no functions such as AIT or Sleep Mode need to be operated manually. The air quality indicator on the display shows the actual air quality measured by the sensors. The fine dust value (PM2.5) of the indoor air is displayed in micrograms per cubic meter and the gas value (TVOC) is displayed in PPM (millionths). Both information is combined as an air quality index. This index is indicated by a numerical scale and on the other hand by a color scale which can also be seen on the front of the display and as an LED display on the device. As long as the value is in the blue to green range, good indoor air can be guaranteed. 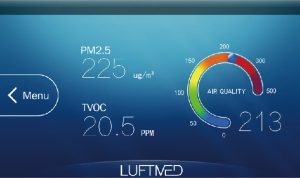 The intelligent filter level indicator uses an algorithm developed by Luftmed itself. This built-in algorithm automatically calculates the remaining lifetime of the HEPA and activated carbon filter in percent. The service life is determined by means of the continuously measured air quality and the operating time of the air purifier. Both values ​​are indicated by 100% downwards. Pressing the Reset button restarts the algorithm when the filters are replaced. 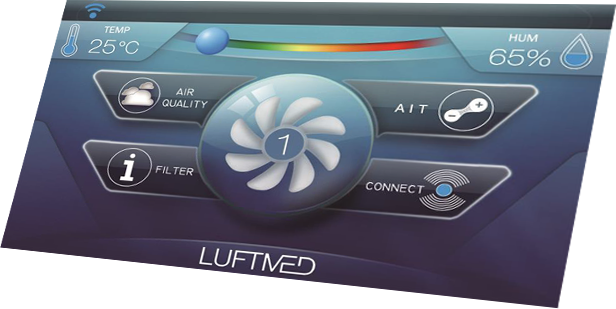 All Luftmed air purifiers for interiors are equipped with integrated WiFi. 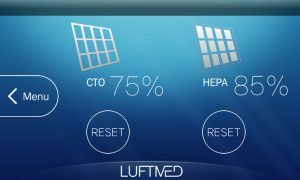 They can be controlled in conjunction with the Luftmed App and a smartphone from anywhere at any time. Two functions can be operated simultaneously with the WiFi Connect on the display. By touching the button briefly, the WiFi can be switched on or off as required. If the key is pressed for a longer time, the QR code page can be connected to the device. By operating the AIT button on the start page, the desired ion concentration can be controlled out of demand. If the AIT button is green, an ion ejection that is specialized for fine dust filtration is generated. A blue AIT button initiates an ion ejection, which is intended for the filtration of organic substances such as viruses and bacteria. In Auto mode, these functions cannot be controlled because the air purifier itself adjusts itself due to the measured air quality and initiates the necessary ion concentration. Intelligent and highly sensitive sensors integrated in the air purifier enable the indoor air quality to be measured and displayed continuously and in real time. The air quality, consisting of the temperature and humidity display as well as a color scale, is displayed on the upper bar of the display. If the cleaning stage (stages 1 to 3) is to be changed, this can be achieved by pressing the fan button once or more. 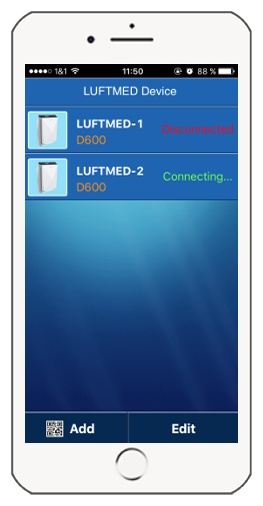 DOWNLOAD THE LUFTMED APP ON TO YOUR SMARTPHONE AND OPERATE YOUR AIR PURIFIER FROM ANYWHERE AT ANY TIME. 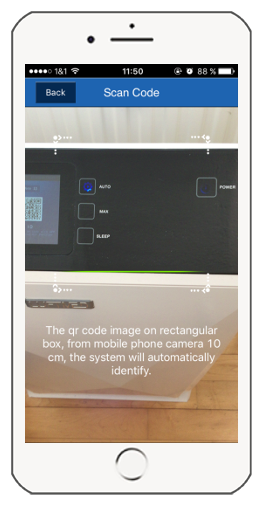 Step 1: Connect your air purifier to WiFi and scan the QR code on the air purifier. Step 2: Your phone automatically connects to the air purifier. Step 3: Now you can control your air purifier with your mobile phone. GET IN CONTACT WITH OUR CONSULTANT.